Everyday business is becoming more dependent on digital technologies, which makes cybersecurity more important than ever to ensure safeness, reputation, and improvement of business. Radware is a global leader in cybersecurity and application delivery solutions for physical, cloud, and software-defined data centers, with DDoS protection, web application firewall (WAF), application delivery and load balancing solutions (ADC) Radware will help to optimize business operations, minimize service delivery degradation and prevent downtime, bringing instant and long-term value to customers. Radware’s mission is to be at the forefront of technology/service advances so our customers can be at the forefront of their industry. 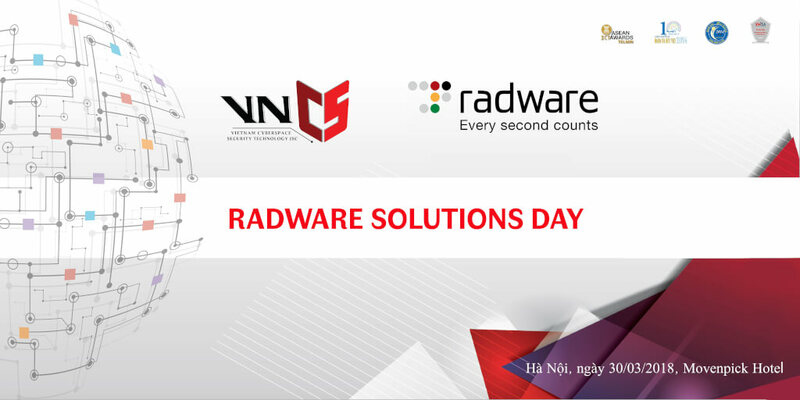 Together with Radware, VNCS will hold The Security Event titled “Radware Solutions Day” on Friday, March 30, 2018 at Movenpick Hanoi Hotel. This event is the place to get answers to your cyber security questions. Find out how you can better keep your organization safe and also optimize your business’s performance.